"The “Chewie Monsta” is the pedal-board controller that Ed uses to control an offstage Roland FC-300, which is the brain behind the looping system currently used (essentially, Mobius 2 VST plug-in hosted by Ableton Live)." Adrian uses a Roland RC-300 controller, according to Guitar Geek's [rig diagram](http://www.guitargeek.com/adrian-belew-2010-guitar-rig-and-gear-setup-diagram/). 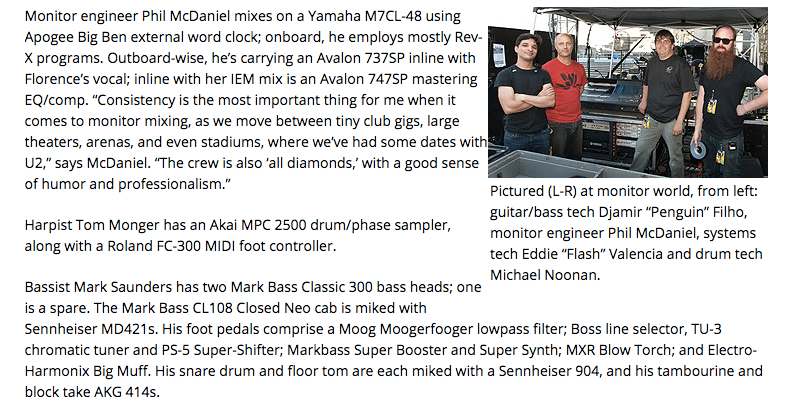 "Harpist Tom Monger has an [Akai MPC 2500](http://equipboard.com/items/akai-mpc-2500) drum/phase sampler, along with a Roland FC-300 MIDI foot controller." - [*Mix Online*](http://www.mixonline.com/news/tours/all-access-florence-and-machine/368254). In this live gear list, one of the things that was mentioned in his rig is the Roland FC-300 MIDI controller. In the Video you can see the brand name "Roland" written on the back of his foot switch at 0:55, and at 1:17 you can see "FC-300" written on the top-left corner of his foot switch. "No, I actually play Becker guitars. They build my Roland [GK-3 Divided Pickup] right into the guitar for me, so my Roland [VG-99 and FC-300] system is seamlessly integrated. It makes it so easy for me to run the Roland system. It’s literally plug and go. It’s really a wonderful piece—the guitar is 100% handmade. It’s made with the quality of a Paul Reed Smith, but it has more of a bluesy tone, an earthy, deep tone." GearFacts took pictures of Bill Bailey's live rig from a show. Gear is clearly shown in photo. This floor pedal will do just about anything via MIDI, and is expandable with extra pedals and/or switches. Really great! Battery or PS; built like a tank. The only thing missing is a computer editor, as patching writing can take time. Simple setup via midi with the Eleven Rack. Worked straight away nothing to do.